Posted on April 12, 2019 at 12:23 pm. Posted on April 3, 2019 at 7:50 pm. ALUS Canada’s CEO, Bryan Gilvesy, presented the case for creative solutions to wetland restoration at the Rural Municipalities of Alberta’s Spring Convention, held March 20, 2019, at the Edmonton Convention Centre. Accompanied by Parkland County’s mayor, Rod Shaigec, Gilvesy explained how ALUS helps communities invest in natural infrastructure on the landscape. In all 25 ALUS communities across six provinces—including 13 local programs in Alberta alone—ALUS projects aim to enhance the function of wetlands and riparian areas on local farms and ranches. And by keeping these projects in good working order each year, ALUS participants produce ecosystem services such as flood resilience, cleaner water, cleaner air and more biodiversity. This is an important return on investment that benefits every community. Posted on March 7, 2019 at 5:04 pm. The Lower Thames Valley Conservation Authority (LTVCA) held a jam-packed breakfast event at Country View Golf Club in Dover Centre on February 28, 2019, to officially launch the new ALUS Chatham-Kent program. “It’s good to see so many really interested and engaged landowners,” said Mike Buis, co-chair of the ALUS Chatham-Kent Partnership Advisory Committee (PAC), who spoke at the press conference and led a lively question-and-answer session. As a partnership between ALUS Canada, A Weston Family Initiative, and the LTVCA, ALUS Chatham-Kent is the 23rd ALUS community in Canada. “My team and I are looking forward to a lot of great things to come from everyone at ALUS Chatham-Kent,” said ALUS Canada’s Eastern Hub Manager, Casey Whitelock. All ALUS projects are intended to produce cleaner water, cleaner air and more biodiversity, including pollinator habitat, for the benefit of everyone in the community. 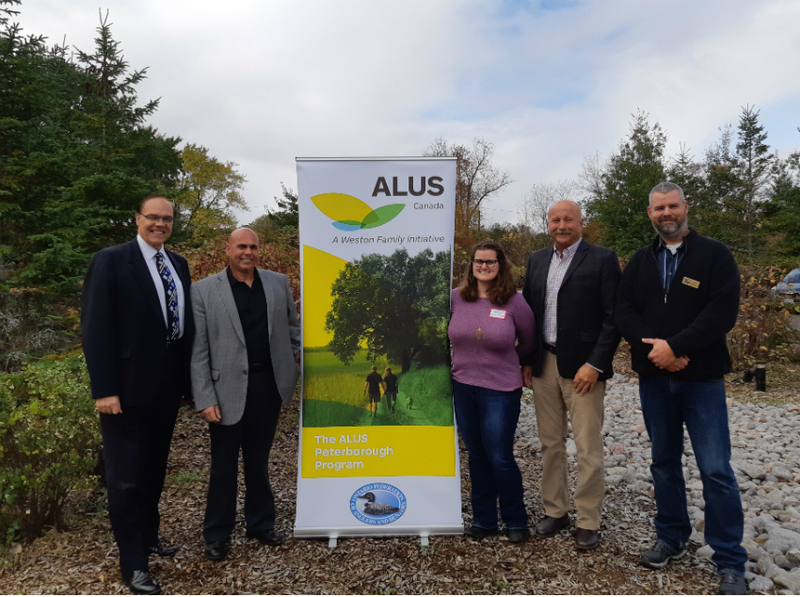 “I am excited to have ALUS in the region, because it will help balance the economics of farming with the economics of conservation,” said Chatham-Kent’s Mayor, Darrin Canniff. Active in six provinces across the nation, the ALUS program helps landowners develop and support environmental projects on their farms that are best suited to local needs and priorities. “We will work with farmers and ranchers to help establish projects that address important local environmental issues, such as deforestation, habitat loss and nutrient loading in Lake Erie,” said ALUS Chatham-Kent Program Coordinator Amanda Blain, who handed out more that 20 expression-of-interest forms to potential ALUS participants during the popular event. ALUS Chatham-Kent PAC member Colin Little presented on harmful algal blooms and best management practices that can help reduce phosphorus loading from agricultural sources. This important work is part of ALUS’ commitment to the Great Lakes Protection Initiative from Environment and Climate Change Canada, who is helping ALUS Canada fund ALUS Chatham-Kent and several other ALUS communities in the Lake Erie region: see announcement here. ALUS Chatham-Kent participants will receive annual, per-acre payments for the management and maintenance of ALUS projects on select parcels of marginal or uneconomic land on their farms—these ALUS projects will typically involve re-establishing and enhancing grasslands, woodlands and wetlands. “We believe this partnership will be beneficial to farmers and to the future of our watershed,” said Mark Peacock, LTVCA’s CAO and Secretary-Treasurer. ALUS Canada is proud to support this new ALUS community with funding from an Ontario Trillium Foundation Grow Grant in partnership with Ontario Nature, as well as from Environment and Climate Change Canada’s Great Lakes Protection Initiative, and from other generous supporters. For more information on ALUS Chatham-Kent, visit their web page here. One of the 36 Conservation Authorities in Ontario, the Lower Thames Valley Conservation Authority (LTVCA) works with the local community to provide services and information to efficiently protect and enhance the environment. The LTVCA has jurisdiction over the watersheds of all streams draining into the Thames River and into Lake Erie, an area covering nearly 3,300 km2 that is home to 107,000 people and 10 member municipalities. Posted on March 1, 2019 at 10:58 pm. ALUS Canada and the Ontario Federation of Anglers and Hunters (OFAH) officially launched the ALUS Peterborough program in the fall, with a special reception followed by a field tour of this ALUS community’s first projects. OFAH’s Executive Director, Angelo Lombardo, welcomed all guests to the Mario Cortellucci Hunting and Fishing Heritage Centre in Peterborough, Ontario, to kick off the October 13 launch with a press conference featuring presentations by ALUS Canada’s CEO, Bryan Gilvesy, and ALUS Peterborough’s Program Coordinator, Henry Bakker. OFAH’s Executive Director, Angelo Lombardo, welcomed all guests to the Mario Cortellucci Hunting and Fishing Heritage Centre in Peterborough, Ontario, to kick off the ALUS Peterborough launch with a press conference on October 13. Gilvesy commended OFAH, and particularly Bakker, for doing a great job getting the program up and running. ALUS Peterborough began as a pilot program in 2016 and, by the time it became official in 2018, local farmers had already enrolled more than 60 acres into the program. All ALUS communities aim to address local environmental concerns; for ALUS Peterborough, these concerns centre around the loss of wildlife habitat in this part of Ontario. To that end, they will plant native trees and shrubs, establish oak savannah agroforestry projects, restore fencerows, riparian zones and native tallgrass prairie, and adopt a delayed-haying program. Going forward, Bakker and his team will work with farmers to identify stewardship opportunities on their land, typically by taking some marginal, uneconomic, environmentally sensitive land out of agricultural production and putting it to the production of ecosystem services instead. The ALUS Peterborough team will also support farmers through the project approval and implementation process, and provide annual, per-acre payments to help them maintain and manage the ALUS projects on their land over time. Doug Kennedy (ALUS Peterborough PAC Chair, on left), Henry Bakker (ALUS Peterborough Program Coordinator, centre) and Bryan Gilvesy (ALUS Canada CEO, on right) celebrate the partnership between ALUS Canada and the Ontario Federation of Anglers and Hunters at the official launch of the ALUS Peterborough program. After a delicious lunch, guests then set out to see some ALUS Peterborough projects on the ground with a guided tour of two ALUS project sites. For the first stop on the tour, guests visited ALUS Peterborough PAC member Michelle Macdonald’s farm, near Omemee. Her first ALUS project involved planting native trees to establish 10.5 acres of oak savannah, a rare Ontario habitat combining grasslands and fire-resistant oaks. In the future, Macdonald intends this ALUS project to support agroforestry, or silvopasture, practices, a mutually beneficial way of integrating trees, forage and grazing for their free-range chickens and pigs, to produce both food and ecosystem services for the community. For the first stop on the tour, guests visited ALUS Peterborough PAC member Michelle Macdonald’s farm, near Omemee. Her first ALUS project involved planting native trees to establish 10.5 acres of oak savannah, a rare Ontario habitat combining grasslands and fire-resistant oaks. Shown here with members of the original ALUS Peterborough PAC, from left to right: Holly Shipclark (Kawartha Conservation), Casey Whitelock (ALUS Canada), Henry Bakker (ALUS Peterborough/OFAH), Michelle Macdonald (and family), Doug Kennedy (PAC Chair), Jeff Wiltshire (MNRF). At the second stop on the tour, guests visited Jim and Catherine Hughes’ farm, near Lindsay, to learn about a fencing project established during ALUS Peterborough’s pilot project phase. ALUS helped the Hughes family erect a fence around 18 acres of wetland and riparian habitat, to keep the farm’s cattle out of this sensitive area. They also installed a watering system in the pasture, to provide an alternate source of fresh water for the livestock, and enhanced the habitat value of this area by planting a mix of native trees and shrubs. With some maintenance and management each year, this ALUS project will continue to produce a whole suite of valuable ecosystem services, such as cleaner water for a large wetland complex located downstream from the property, and improved wildlife habitat for aquatic and other species on the farm. At the second stop on the tour, guests visited an ALUS Peterborough project on Jim and Catherine Hughes’ farm, near Lindsay. This project includes strong fencing to keep cattle out of 18 acres of wetlands and riparian zones, an alternate source of fresh water installed in the pasture, and habitat enhancement with native trees and shrubs. With some maintenance and management each year, this project will continue to produce a whole suite of valuable ecosystem services, such as cleaner water and improved wildlife habitat. By the end of the day, guests had seen how the ALUS program works on the ground, and how strongly it can benefit their community in Peterborough and Kawartha Lakes. ALUS Canada is proud to support this new ALUS community with funding from an Ontario Trillium Foundation Grow Grant, in partnership with Ontario Nature, as well as from the Species at Risk Stewardship Fund from the Ministry of Natural Resources and Forestry, from The W. Garfield Weston Foundation and our other Foundational Partners, and from all our generous donors. Please visit the ALUS Peterborough web page for more information. With a successful press conference and the first-ever ALUS Peterborough field tour, the Peterborough and Kawartha Lakes community had a full day to experience what the ALUS program is all about, and to see how strongly it can benefit their community. From left to right: Pete Peeters, Pat Buxton, Holly Shipclark (front), Joe Banbury (behind), Casey Whitelock, Sarah Wilhelm (behind), David Schelhas, Andrew Macdonald (behind), Henry Bakker, Michelle Macdonald, Doug Kennedy, Jeff Wiltshire, Mike Evers, Stephen Huntley, Chris Robinson. Posted on February 8, 2019 at 8:31 pm. Posted on February 5, 2019 at 9:43 pm. Thanks to the Battle River Watershed Alliance for recognizing several ALUS participants in Alberta for their outstanding environmental stewardship work. The 2018 OTIS Awards have been presented to Alana and Justin Schamber (ALUS Wetaskiwin-Leduc) and Marie and Don Ruzicka (ALUS Flagstaff). Congratulations to ALUS participants Alana and Justin Schamber (ALUS Wetaskiwin-Leduc) and Marie and Don Ruzicka (ALUS Flagstaff) for earning 2018 OTIS Awards in recognition of their outstanding environmental stewardship. This year’s Farm Award went to Tin Forest Farm, where ALUS Wetaskiwin-Leduc participants Alana and Justin Schamber are excellent wetland caretakers who also work to raise awareness about local food and connect people to the land through farm tours and kids camps. They have worked with ALUS to establish fences around the wetlands to exclude their livestock, thus preserving the ecological integrity of the surface water and creek that run through this area—indeed, wetlands cover approximately a third of their farm. Congratulations to ALUS Wetaskiwin-Leduc participants Alana and Justin Schamber of Tin Forest Farm, who have been awarded a 2018 OTIS Award by the Battle River Watershed Alliance for their excellence as wetland caretakers who also work to raise awareness through farm tours and kids camps. Click for more information on the ALUS Wetaskiwin-Leduc program. This year’s Individual Award was presented to ALUS Flagstaff participants Marie and Don Ruzicka for “Leading By Example” on Sunrise Farm, northwest of Killam, Alberta. The Ruzickas farmed their 800 acres conventionally until 1995, when a course in holistic management changed how they viewed the land: They now manage their land organically and holistically to produce healthy plant communities. As ALUS participants, they have restored native grasslands, enhanced wetlands, and planted buffer areas around them for wildlife habitat, which has triggered a resurgence of biodiversity on their farm. Click for more information on the ALUS Flagstaff program. “We want to thank the Battle River Watershed Alliance for recognizing some of our ALUS participants as the outstanding stewards of the land that they are,” said Christine Campbell, ALUS Canada’s Western Hub Manager. Congratulations to ALUS Flagstaff participants Marie and Don Ruzicka for earning a 2018 OTIS Award for “Leading By Example” on Sunrise Farm. They have restored native grasslands, enhanced wetlands, and planted buffer areas to trigger a resurgence of biodiversity on their land, and have worked on many educational initiatives to connect youth to the land and to farming. The Battle River Watershed Alliance (BRWA) is the designated Watershed Planning and Advisory Council for the Battle River and Sounding Creek Watersheds in Alberta. Founded in 2006, it is a non-governmental organization dedicated to preserving and enhancing the land and water in these basins by taking a balanced approach for healthy natural areas, resilient communities, and a stable economy. The Battle River Watershed Alliance (BRWA) is the designated Watershed Planning and Advisory Council for the Battle River and Sounding Creek Watersheds in Alberta. Posted on January 30, 2019 at 3:30 pm. The whole Ziola family helps maintain the many ALUS projects on Iron Kreek Ranch, in Red Deer County, Alberta. Here, Roxanne (on right) and Josi (on left) clean out and “re-stuff” some Mallard hen nesting structures. Located near snowy Sylvan Lake, Alberta, ALUS Red Deer County participants Kevin and Roxanne Ziola run Iron Kreek Ranch, a 1,600-acre (10 quarter-section) cow/calf and lamb operation that incorporates 21 different ALUS projects. ALUS participants since 2014, the Ziolas’ commitment to the program continues to increase each year. Kevin joined the ALUS Red Deer County PAC (Partnership Advisory Committee) in 2016, and started serving as a Farmer Liaison for the ALUS Red Deer County program in 2019. They have so far enrolled 28 acres of their land into the program for 21 ALUS projects, including year-round alternative livestock waterers and about four kilometres of riparian fencing. Ranchers Kevin and Roxanne Ziola’s first major ALUS project was wildlife-friendly fencing to prevent their cattle from getting into the Tindastoll Creek that through their land in Red Deer County, Alberta. Their first major ALUS project was to prevent their cattle from getting into the Tindastoll Creek, which runs through most of their land. ALUS helped them fence off the creek to protect the banks, improve riparian habitat and preserve water quality for communities downstream. “We ran a hot wire along both sides of the creek. It keeps the cattle out but still lets the wildlife in. It works really well,” says Kevin. They enhanced the riparian zone on both sides of the creek by planting trees and shrubs and establishing wildlife habitat structures, such as Mallard hen nesting tunnels (see photo above). Barred from accessing the creek, the livestock need an alternative source of drinking water. ALUS helped the Ziolas install an off-site watering system: Every spring, the creek fills a dugout pond for a year-round supply of fresh water at three drinking stations located in the pastures (see photo). ALUS Red Deer County helped participant Kevin Ziola establish this off-site watering system to supply Iron Kreek Ranch’s cattle with fresh drinking water year-round. “It works really well,” he says. Coupled with wildlife-friendly fending to keep the cows out of the nearby creek, this ALUS project helps protect the banks, the riparian habitat zone and water quality for communities downstream. All the Ziolas’ ALUS projects are helping the environment by improving riparian areas and buffer zones, providing habitat for waterfowl, creating wildlife corridors, producing cleaner water, greater biodiversity and other ecosystem services for the wider community. The land has been in the Ziola family since 1947, when Kevin’s grandparents arrived from Saskatchewan. Kevin and Roxanne’s children now represent the fourth generation on the family farm. The eldest, Josi, already helps her parents manage some of the ALUS projects on their land, as part of a family that actively pursues success on both agricultural and environmental fronts. Not surprisingly, the Ziolas were nominated for an Alberta Beef Environmental Stewardship Award in 2017. In September 2017, ALUS Red Deer County participants Kevin and Roxanne Ziola hosted a tour of their ALUS projects on Iron Kreek Ranch near Sylvan Lake, Alberta. Kevin is also a PAC member and Farmer Liaison. Posted on December 23, 2018 at 5:03 pm. Husband-and-wife team DeLee and Larry Grant, whose property is located near White City, Saskatchewan, are a perfect example of community members who actively engage with the ALUS program at many levels. It’s no secret that one of the strongest assets of the ALUS program is its flexibility—and this is certainly the case in ALUS WUQWATR, Saskatchewan. ALUS is known across Canada as a community-developed program that addresses local environmental priorities, respects agricultural knowhow and relies on the input and involvement of local community members. Husband-and-wife team Larry and DeLee Grant, whose property is located near White City, Saskatchewan, are a perfect example of community members who actively engage with the ALUS program at many levels. Larry joined Saskatchewan’s first-ever Partnership Advisory Committee (PAC) in 2011. Since then, he has taken on the role of Chair of the ALUS WUQWATR PAC, while he and DeLee have also signed up as participants. The Grants’ main ALUS project is a five-acre reforestation site, featuring diverse tree species commonly found in Saskatchewan, such as prickly rose, spruce, poplar, pin cherry and lilac. The project was initiated by the Grants, with the support of neighbours who kindly pitched in for a long spring day of tree-planting in the late spring of 2013. The ALUS WUQWATR community, which is a partnership between ALUS Canada and the source-water protection agency known as the Wascana and Upper Qu’Appelle Watersheds Association Taking Responsibility (WUQWATR), helped advise and guide the project, shared the cost of planting the tree seedlings, and now provides an annual payment for Larry and DeLee’s continued management and maintenance of their ALUS project. Habitat is just one of the ecosystem services produced by this ALUS project: The trees also sequester carbon, improve the health of the soil and retain water on the landscape, which is an important boon for the community at large. “We really appreciate our shelterbelt. It’s about a mile and half long, and we walk around it every day. We look forward to enjoying it for many years to come, knowing that it serves a purpose for the environment, and for the community as well,” says Larry. In this way, the Grants’ ALUS project not only helps to keep the participants themselves flexible and strong, it also showcases the flexibility and strength of the community-based ALUS program that they continue to support, and to help lead. Posted on December 15, 2018 at 7:32 pm. ALUS Lambton participants Scott & Susan Stephens produce 25 acres of ecosystem services in Brigden, Ontario. 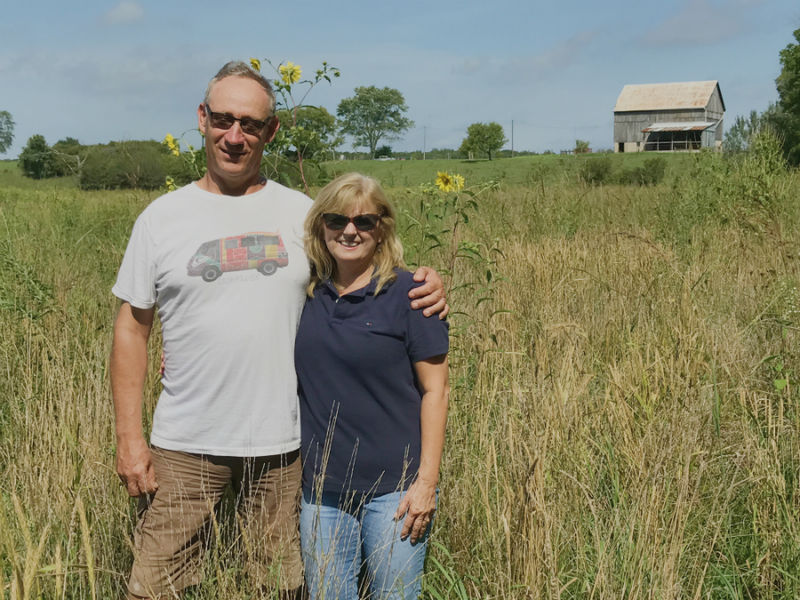 ALUS Lambton participants Scott and Susan Stephens maintain eight ALUS projects on environmentally sensitive parcels of land on Meadowlea Farms, including this Ontario native tallgrass prairie project producing excellent habitat for pollinators and wildlife. There are a number of impressive century farms across southwestern Ontario. And some of them, such as Meadowlea Farms Inc.in Brigden (St. Clair Township), are hard at work producing ecosystem services, such as cleaner water, cleaner air and more biodiversity, in addition to their traditional crops. Meadowlea Farms has been in ALUS Lambton participants Scott and Susan Stephens’ family for 120 years. The land consists of 800 acres of fields growing cash crops such as corn, soybean, wheat, a 100-acre woodlot, 10 acres of pasture, and a little more than 25 acres of ALUS projects. Signing up as participants in 2016, the Stephens now have eight ALUS projects established on environmentally sensitive parcels of land, including riparian and flood plain areas. They have enhanced and created some wetlands and restored the buffer strips around them. They have also planted trees and shrubs to create wooded upland habitats, and planted Ontario native tallgrass prairie species to increase the grassland habitat on their land. “Some of our fields have telephone poles in them, which are hard to farm around. We turned that area into a strip of native tallgrass prairie, to act as a buffer zone between the field and the ditch. It filters the water running off the fields to capture phosphorus, and serves as a wildlife corridor with food for pollinators and great cover for ground-nesting birds,” says Susan. By next year, this ALUS project will be a thick strip of native tallgrass prairie growing more than seven feet tall. It will act as a buffer zone between the field and the ditch, capturing phosphorus and filtering the water running off the fields, and will serve as a wildlife corridor with food for pollinators and great cover for ground-nesting birds. “On some of our other ALUS projects, we have trees growing in there now, we see more wildlife, more butterflies, and we have nice opportunities for outdoor activities with our family–we’ve gone canoeing up there, and skating and snowmobiling in the winter,” Susan continues. All the Stephens’ ALUS projects are helping the environment in many ways. Their tallgrass prairie projects protect soil health while creating beneficial pollinator habitat, for instance. Meanwhile, their wetland and riparian projects help improve fish habitat, water quality and quantity in the adjacent Black Creek, a major tributary to the Sydenham River, which is home to numerous species-at-risk. In this way, the ALUS projects also help reduce phosphorus loads in the Sydenham River watershed, to contribute to a healthier ecosystem in the Great Lakes region for future generations. “Scott and Susan have always had a passion for the outdoors and for wildlife,” says ALUS Lambton Program Coordinator Lindsay Buchanan, recalling how their property was selected by the Ministry of Natural Resources many years ago as a good site to release wild turkeys as part of efforts to reintroduce the native bird to this region. ALUS Lambton participants Scott and Susan Stephens produce 25 acres of ecosystem services (cleaner air, cleaner water and more biodiversity) in Brigden, Ontario. View short video on ALUS Canada’s YouTube channel. Posted on December 1, 2018 at 7:13 pm. ALUS Canada’s Board Director Larry Kaumeyer (centre) and long-time supporter David Bissett co-hosted a special event at Calgary’s storied Ranchmen’s Club on November 28, 2018, to celebrate ALUS’ strong presence in Alberta. From L to R: Trish Nixon (Corporate Affairs, United Farmers of Alberta Cooperative); (back) Kim Sturgess (CEO & Founder, Alberta WaterSmart); event co-host Larry Kaumeyer (ALUS Canada Board Director and CEO, Buffalo Inspection Services); Greg Shyba (CEO, Ann & Sandy Cross Conservation Area and Chair, Calgary Foundation Environment Committee). On November 28, a group of 20 Albertan business leaders joined ALUS Canada supporters and senior staff to celebrate ALUS’ strong presence in Alberta. The event, at Calgary’s storied Ranchmen’s Club, was co-hosted by ALUS Canada’s Board Director, Larry Kaumeyer (CEO, Buffalo Inspection Services), and long-term ALUS supporter David Bissett. In his opening remarks, Kaumeyer introduced ALUS Canada, A Weston Family Initiative, as a national charitable organization whose program supports farmers and ranchers who produce cleaner air, cleaner water, more biodiversity and other ecosystem services in their communities. He thanked his co-host, David Bissett, who recently renewed his longstanding support for ALUS by creating the Bissett Action Fund in 2017. The expansion of the ALUS program in Alberta is a testament of the success of its science-based, voluntary approach and, as ALUS’ western team can attest, there has been strong growth in demand from municipalities. From L to R: Bryan Gilvesy (CEO, ALUS Canada); Al Kemmere (President, Rural Municipalities of Alberta); Brian Rodgers (ALUS Mountain View PAC member); (back) Christine Campbell (Western Hub Manager, ALUS Canada); Sean La Brie (ALUS Mountain View PAC member). ALUS Canada’s CEO, Bryan Gilvesy, described ALUS Canada’s scope across the nation, mentioning that the program has grown to 22 ALUS communities in six provinces, with nearly 600 participants. ALUS has enjoyed particular success in Alberta, home to 9,000 acres of ALUS projects, which represents roughly half of the program’s national total. As ALUS’ western team can attest, there has been strong growth in demand from municipalities; the expansion of the ALUS program in Alberta is a testament of the success of its science-based, voluntary approach. “We see a great deal of enthusiasm in Alberta. We recognize that there is very strong community support for ALUS here and that the potential for expansion is huge,” said ALUS Canada CEO Bryan Gilvesy, pictured here with longstanding ALUS supporter and event co-host David Bissett, whose Bissett Action Fund has already helped 45 farmers and ranchers redeploy nearly 1,000 acres of marginal land to the production of #ecosystem services that benefit all Albertans. The ALUS program is supported through a blend of philanthropic funding and government grants, with a new foray into corporate sponsorships. Katherine Balpataky, who recently joined ALUS as the Director of Corporate Partnerships and Business Development, works with business leaders to cultivate high-impact partnerships through this program, New Acre™ Project. Balpataky, along with all of ALUS Canada’s team, senior leadership and long-time supporters, are eager to develop new partnerships and help the ALUS program grow in Alberta, so that more farmers and ranchers can produce cleaner air, cleaner water and more wildlife habitat in their communities. For more information on New Acre™ Project, please contact kbalpataky [@] alus.ca or visit ALUS.ca. Putting ALUS on the map in Alberta! The ALUS program is supported through a blend of philanthropic funding and government grants, with a new foray into corporate sponsorships. With the New Acre™ Project. ALUS Canada is eager to develop new partnerships and help the ALUS program grow in Alberta, so that more farmers and ranchers can produce cleaner air, cleaner water and more wildlife habitat in their communities.